Caleb LOVES frogs. This year he has been fascinated with the bullfrogs at Treasure Lake spending many an hour trying to catch one. This past week with the help of Daniel he succeeded! 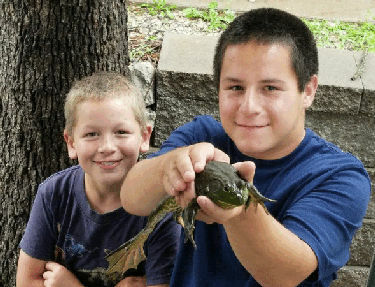 Yes, if you have never seen a bullfrog up close these things are HUGE! Of course Caleb wanted to keep it so we agreed he could have it overnight and then release it the following morning. Hee! Hee! That evening around 11:15 there arose such a clatter and the bullfrog escaped from Caleb’s outdoor prison. Oh well, can’t say I blame it! Caleb has had another lizard for a few days, probably over a week, but decided to let that one go today. He has been feeding it bugs etc. and making sure that it always had fresh water. 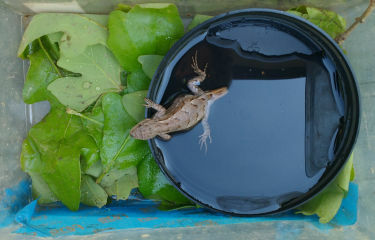 I think there are still two captive frogs! LOL! GREAT science lessons though. Always better to see things like this for real rather than in textbooks. Caleb has also seen quite a few snakes this year as he has been digging under rocks etc. Richard gave him a little insight into what would happen if he got bitten by a copperhead last evening. (Being a paramedic he was not gentle on the graphics.) Hopefully that will deter Caleb’s curiosity a little!